Traditionally ‘short scale bass’ has largely been associated with student basses and limited, muddy tones – not any more!!! 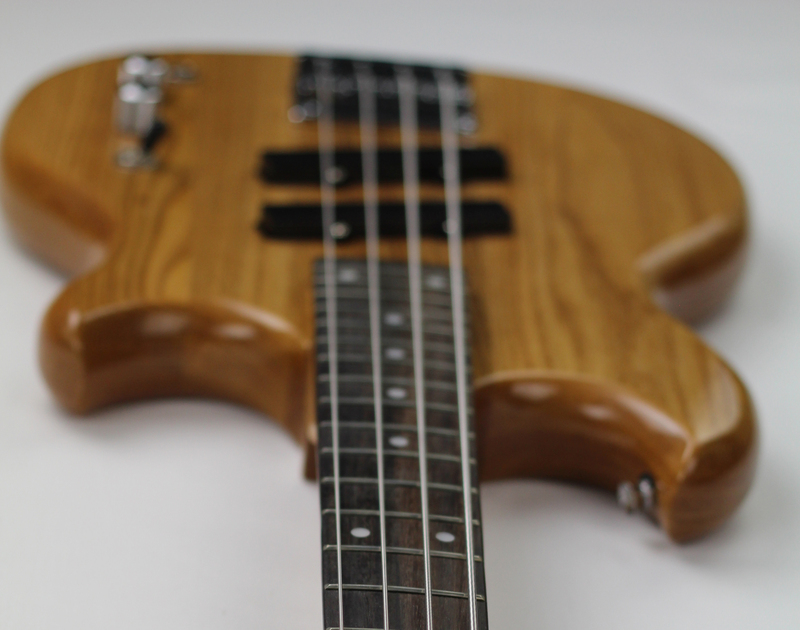 The SWB-1 Standard is a professional, modern-sounding short scale bass affordable to everyone. 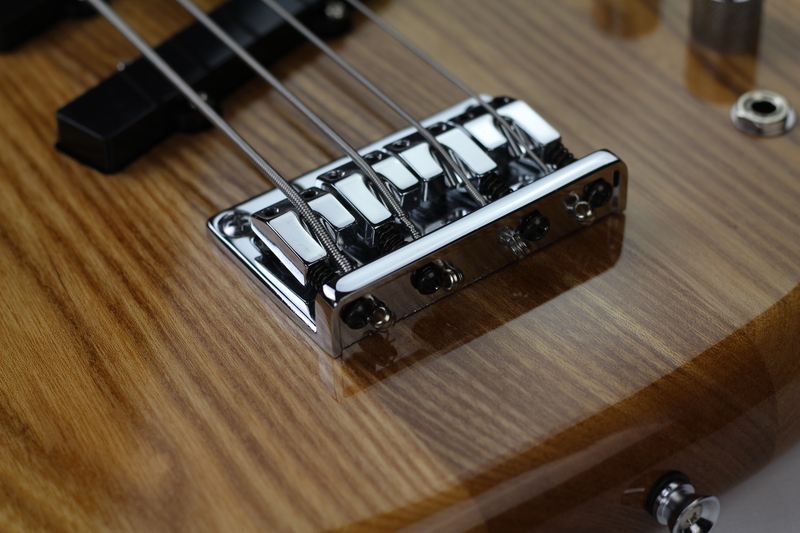 The SWB-1 Standard is an incredibly flexible bass and suits any style of playing – from growly traditional through to scooped, hi-fi slap tones and everything in between. Available passive or active (with genuine EMG EQ system) and in solid ash or mahogany, fretted or fretless there’s an SWB-1 Standard to suit everyone. The angled pickups make for a more natural transition from low to high strings – the low strings stay nice and focused whilst keeping the higher strings fuller-sounding. 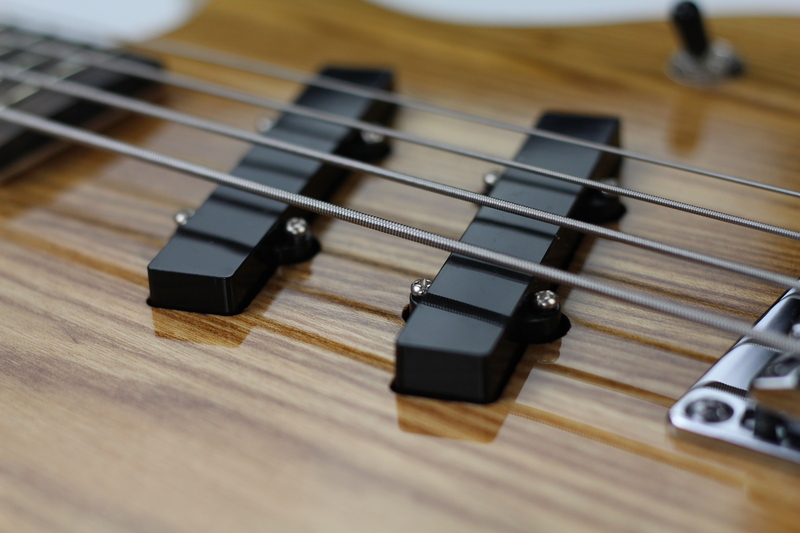 The 30.75” scale & beautifully slim yet substantial neck feel instantly easy & natural to play without stretching. 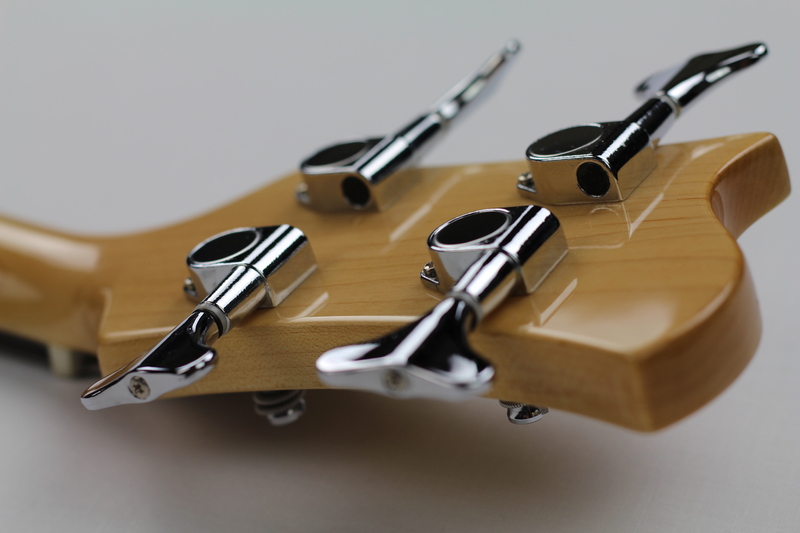 The high mass chrome bridge provides 18mm string spacing which aids faster, easier playing without feeling too unfamiliar when coming from the 19mm spacing used on most bigger basses. The simple yet elegant body shape is extremely comfortable with it’s smooth rounded edges. Love the sound and look of the SWB-1. Could you advise whether these are available through an outlet in Oz…or failing that how much it would cost to have one sent to me. Thanks for the comments. 🙂 Presently they are only available direct from me here in the UK. Shipping to Oz is £140, so a passive version including shipping would work out at 1015.18 Australian Dollars. Hi Steve – thanks for your comment. I’m interested in a 5string mahogany swb-1,do you make those,if so how much,Ilive in the U.S., THANK YOU! Hi Craig – thanks for your message! Looking for a professional short scale 5 string. How soon before you have one out? What’s the price range on your 4 string models? You have become my favorite teacher ! I’m all about the short scale. Are these basses good to go in the US? Hi Zane – thanks for the kind words, and for your question. There is now a much more affordable shipping option to the US – choose Landmark at checkout. Is for the future maybe planned also a version of the SWB-1with different or larger pickups (not angled) like humbuckers for example ? Hi Francesco – thanks for your question! Scott are you playing an active or passive SWB 1 on you tube, that bass is kickin !!! Could be either Ron – could you copy and paste the link? scott, loving the 5 string idea. time frame? No time frame yet – will update asap…. 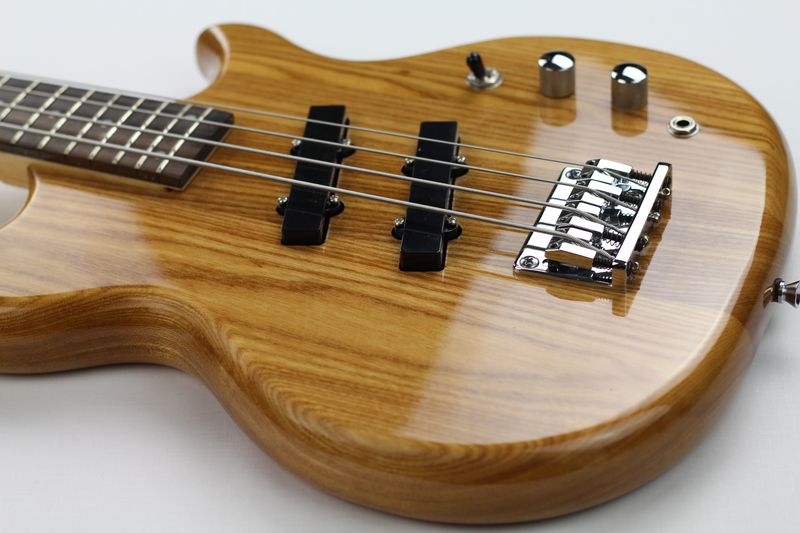 Hi Scott I saw/heard your basses in YouTube and I got very interested on buying a Mahogany active but I wonder if there is any possibility to get on another color instead of natural? I’m seriously considering your fretless version of swb-1. I have a long scale fretless but it ‘s hard to get around due to the distance between frets and the long reach. How much would it cost me to get one sent to Australia? Plus, how much would said bass weigh, as I bought a Fender Rascal (online) once and it weighed a ton! (I love short scale but HATE heavy basses.) Thanks. Hi Anthony – thanks for your message! what’s the difference between the ash and mahogany besides the texture of the wood? does this affect the sound? Just added a fretless SWB-1 to the fretted version I’ve had for a few weeks (both ash/passive). Both punch well above their weight and I’m delighted with them. I also play a Fender Rascal and can tell Anthony that he’ll find the SWB-1 to be light relief in comparison!! I love the sound of your bass, i´m from Ecuador in south américa and i Love to have one of your excelent basses, please write me if there is a possibility to purchase one of them, Hola from Ecuador! 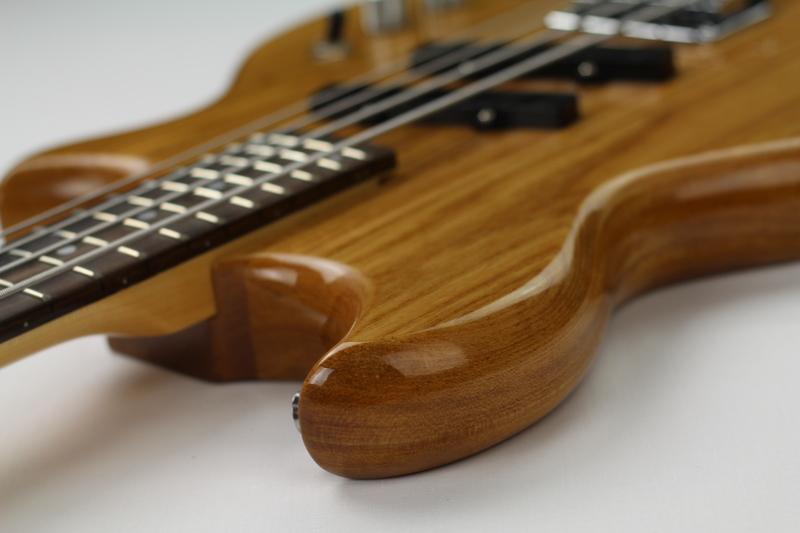 Are your Basses beeing produced in Great Britain? Are there any big changes in the sound when either mahagony or ash? 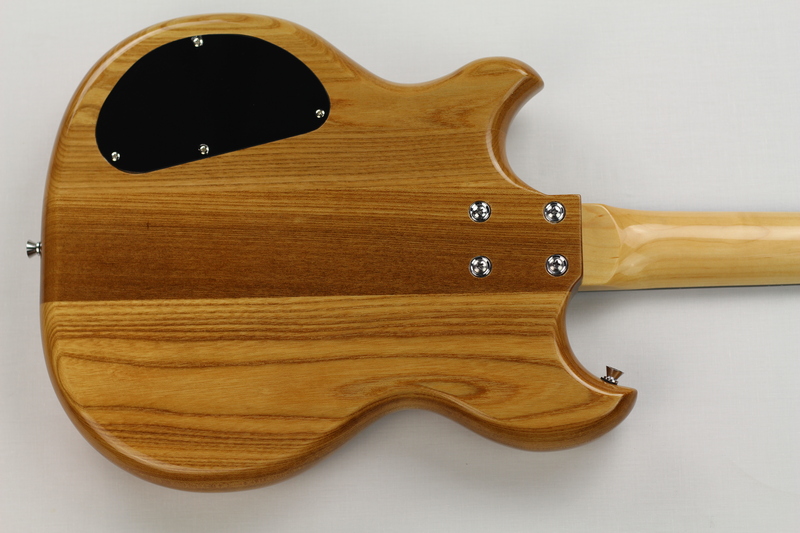 What wood is the neck? Received my SWB-1 today and was blown away by its build quality and sound. I opted for the active version and it sounds awesome. Being more of a guitar player, I’ve struggled with full-scale bass necks, but the SWB-1 makes it so much easier to play being shorter scale – this is definitely a case where size doesn’t matter. Ready to play, straight out the box with no setup required – it was still dead in tune when it arrived ! Looks grea! My fiancé would love this if it came in red cherry stain like Gibson eb-0. I would personally like to see hand rubbed oil finish, emgdc, Kahler them, graphtec nut,schaller straploks and a hipshot detuner! ? None the less, great looking bass. Body looks to be well thought out. Is the fretless SWB-1 available unlined? 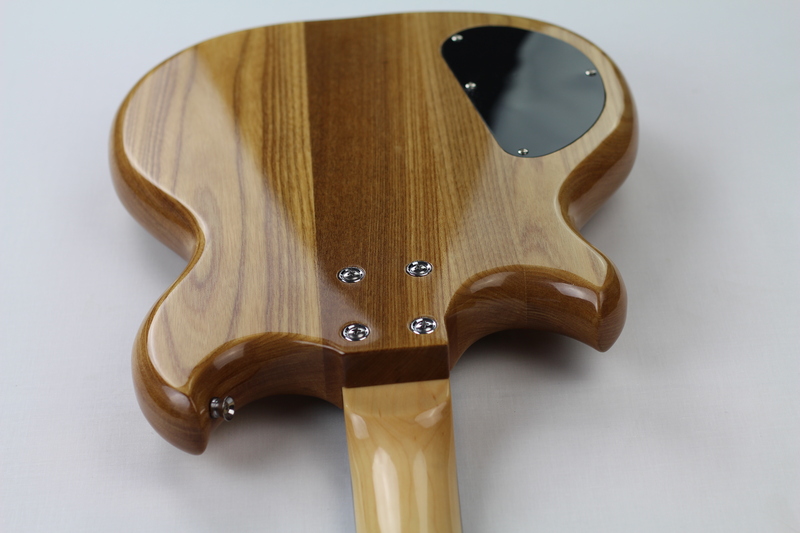 Just placed my order for one of your Bass Guitars from Chowny. Can’t wait to get it. You truly are a gifted Bass Player and a very entertaining video producer. Keep them coming. Sorry but had to cancel the order. Chowny kept putting the delivery back. Feb delivery, then March, then April. Had to cut my losses and go elsewhere. Hi Scott, I’m just curious about the five string bass. A year ago you wrote here that you are playing with the idea. Is it still likely that you will make the five stringer in the near future? Thanks a lot! Greetings Of Shalom Scott. Is it still too early to know when the SWB-1 2nd generation will be available? so which one is the active one? 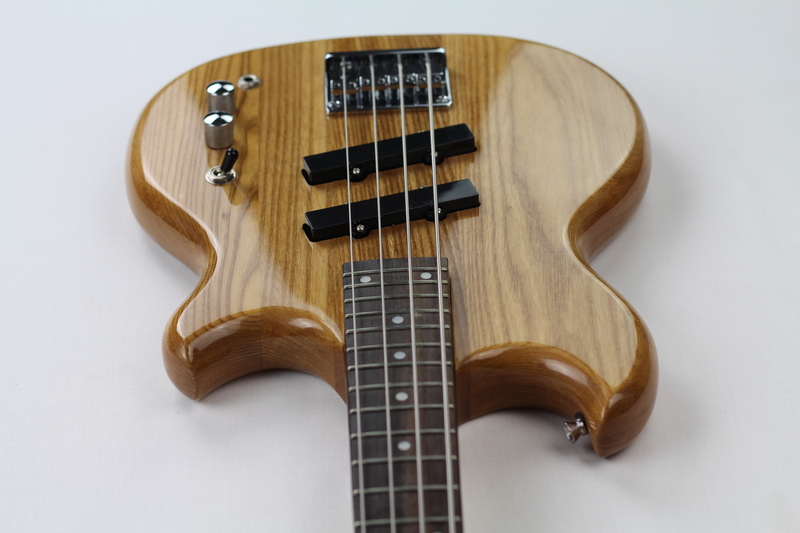 I’ve been trying to get a fretless like the ones in your videos – however, Chowney say they are only producing unlined ones! I have always played a lined one and don’t see much point in unlined – especially when you have to hit that note at the other end of the fingerboard. My fretless is coming to the end of its days unfortunately and I have quite small hands – so looking for something a little more comfortable. I don’t suppose you have any of the unlined still for sale? Hi Paul! Very odd you should bring this up as I’m currently selling my own personal fretless SWB-1. I’ve now got two fretless SWB-1s (which is overkill for me as I only play it occasionally) so have put it up for grabs. Please guide me how to get SWB-1 in India. total cost- shipping charges along with SWB-1 hard case to my doorstep. (total amount). Can i pay in indian currency? Does the active version has a passive option with it? How about on the pro version? and want to put on some flat wounds. What size do I order? Any suggestions? 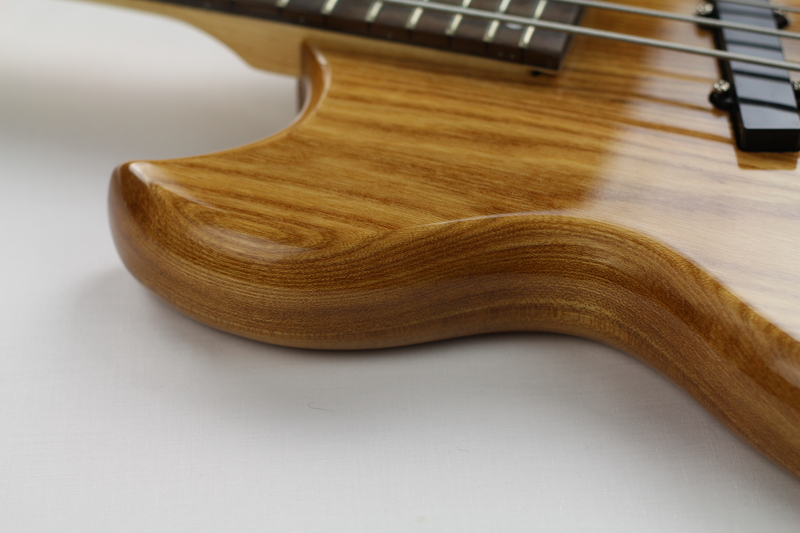 Do you have any fretless models for sale? I am curios if you have any used SWB ! Chowny Basses. I would want though the one with the rounded edge neck. I am looking for a used bass. I am a begginer at age 66, so my budget is so limited. I have so enjoyed seeing your on line lessons. 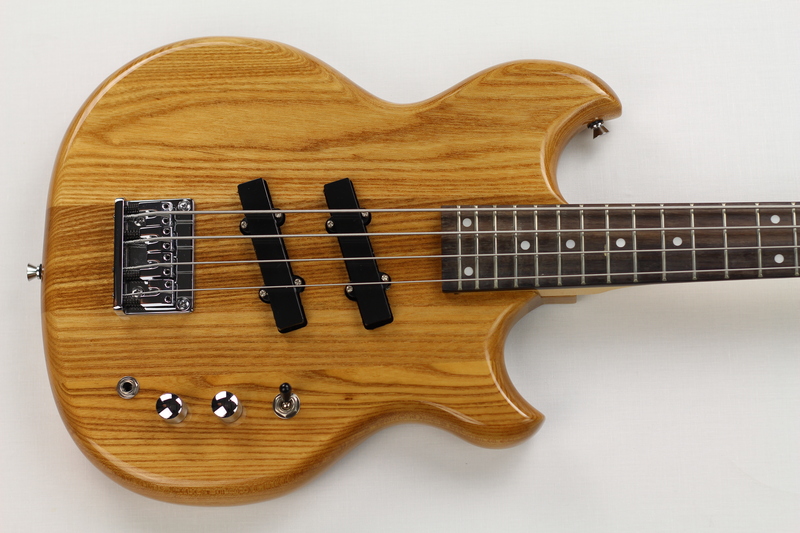 Is there a version of your short-scale bass that has two humbuckers kind of like an Alembic Stanley Clarke model. Such an offering would be most attractive to me. I do dig the way the SWB-1 sounds. Good work, friend! Cheers!